It’s been staring us in the face for the past four-plus billion years. One of the cleanest, greenest and most renewable energy sources we could ever know: the sun. However, its massive power potential has yet to be fully harnessed due to the lack of a way to store it. As soon as the sun goes down, solar power ceases. It’s as simple as that. Scientists the world over have been searching for a way around this problem, and as of recently, may just be in reach of a solution. Picture the giant smoke stacks and industrial Mecca of Mr. Monty Burns’s nuclear power plant in Springfield. (Homer Simpson sitting with his feet propped up on the control grid of his operating station.) Replace the black smoke spouting stacks with giant mirror-like reflector panels and you have one of the latest alternative technological advances the world has seen. 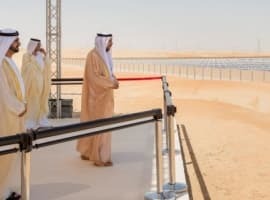 The world’s very first hybrid solar power plant is already in operation, and has been for the past several months. It is located in Yavne, Israel and has been provided by a company called AORA Solar. The energy produced and sustained by this plant is very similar to the power produced by common hybrid vehicles. 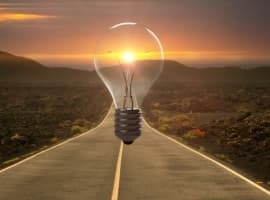 Just as a hybrid vehicle runs on electric power until the engine needs more energy to produce the same amount of power and so shifts to gasoline, hybrid solar power plants make a similar fuel switch depending on the amount of sunlight available. During the daytime, concentrated sunlight heats compressed air that provides energy to turn electric turbines, generating storable energy. When the sun sets or the sky is full of clouds, resulting in the sun’s rays being blocked, the hybrid portion of the system takes over. Specifically, an inline microturbine powered by biodiesel, natural gas or bio fuel. This microturbine, in turn, drives another electric turbine, producing power. The power generated by this system can provide energy for 70 homes 24 hours a day, seven days a week. The hybrid solar power plant design also has the potential to provide power to off-grid power communities, factories or companies. Scientists are only waiting on the technology and efficiency of the biofuel industry to improve and become more sustainable for more of these plants to start construction around the world. Now, all of this may have an initial striking appeal... Where do I sign up?! 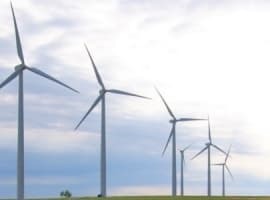 However, several points should also be taken into account when considering this major alternative energy move, particularly the cost. These plants aren’t cheap, and they can take decades to plan and construct. And what about the current state of the world economy? The future of hybrid solar power plants boils down to whether or not we can afford this move. Certainly, the planet would benefit immensely from such a clean energy producing power alternative, but at what costs to our economies, and even our own wallets? Solar Energy - Are Our Expectations Too High? In my humble but stubborn opinion; the ONLY serious solar energy alternative is to put the darn things in high-Earth orbit. You get 10x the solar energy over earth-based PV panels, and it's 24 hours/day. Power then microwaved to ground-based antenna receivers. Granted it's a new idea, people have been working out the engineering bugs barely 40 years or so. But if rumour be true, (it NEVER is), in the early 1980's Big Oil and friends killed off the practical research begun by NASA and the Soviet space program to work out the bugs. Cut the Department of Defense budget in half (1/2 of 1.2 Trillion) and we'll be able to afford it just fine.